 The modest Thomas Mann boom, begun with the recent publication (by New Directions) of his early stories, continues with this fine new English translation of the author's last great novel, first published in 1948. 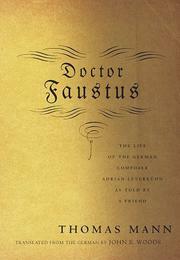 A work written in old age and suffused with Mann's moral despair over his country's complacent embrace of Nazism, Doctor Faustus unrelentingly details the rise and fall of Adrian LeverkÅhn, a gifted musician (modeled, as Mann admitted, on modernist innovator Arnold Schoenberg) who effectively sells his soul to the devil for a generation of renown as the greatest living composer. Woods's vigorous translation works brilliantly on two counts: It catches both the logic and the music of Mann's intricate mandarin sentences (if one reads closely, the rewards are great); and it gives the novel's narrator (``Adrian's intimate from his hometown'') a truly distinctive voice, making him more of an involved character than a rhetorical device. Mann's most Dostoevskyan novel should, in this splendid new version, speak more powerfully than ever to contemporary readers.